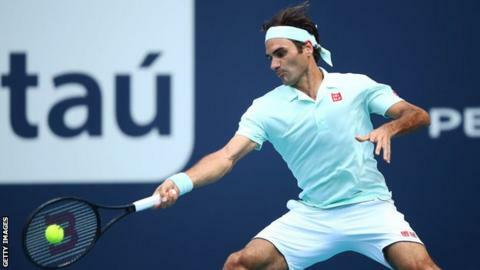 Three-time champion Roger Federer eased into the quarter-finals of the Miami Open with a straight-set victory over Russia's Daniil Medvedev. Switzerland's Federer, who last won the title in 2017, beat the 13th seed 6-4 6-2 in one hour and one minute. The 37-year-old fourth seed, who hit 22 winners and won nine of the final 11 games, will play South Africa's Kevin Anderson in the last eight. "I thought it was an interesting match," Federer said. "There were really long rallies, tactical points. The big points went my way and that was the difference. World number five Federer has lost to Anderson only once in six meetings, at Wimbledon in 2018. Anderson beat Australia's Jordan Thompson 7-5 7-5 to reach the quarter-finals in Miami. "Kevin is a great player, he's got one of great serves in the game at the moment," Federer said. "In America on hard courts, that's his cup of tea, but I'm playing well and I hope I can bother him."